The market for connected and embedded car navigation needs a kick-start. Lengthy design cycles and a fragmented supply chain have contributed to a sector that lags far behind consumer expectation and now sees Apple and Google as direct competitors for the in-vehicle experience space. OEMs need partners who can help them radically overhaul their navigation services, feature development, deployment, and monetization programs. 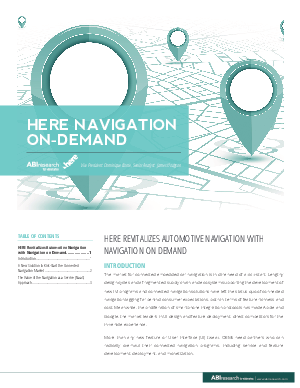 This whitepaper outlines how HERE Technologies has created a new solution to kick-start the connected navigation market.